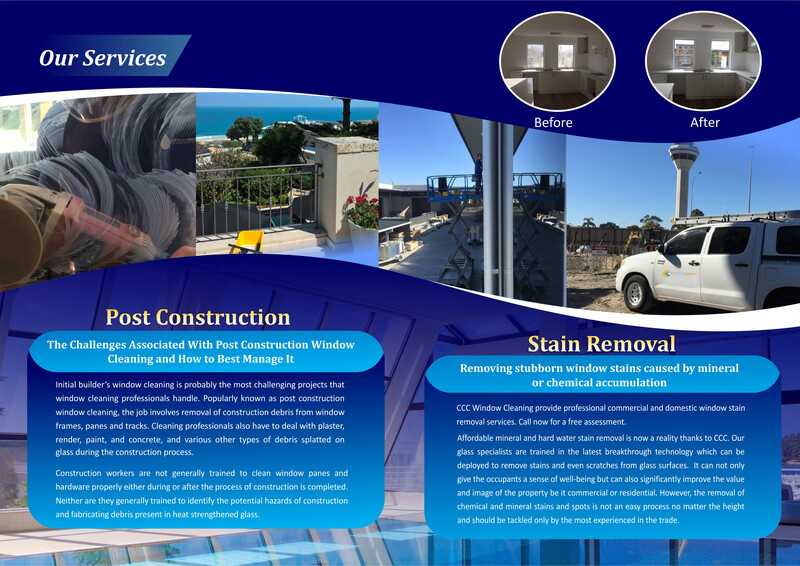 CCC Window Cleaning provide professional commercial and domestic window stain removal services. Call now for a free assessment. Algae, fungus and stains from minerals and hard water can ruin the look of your building exterior, especially windows and frames. It is important to clean the external surfaces and windows regularly to ensure that your exteriors look new and attractive. It can not only give the occupants a sense of well-being but can also significantly improve the value and image of the property be it commercial or residential. However, the removal of chemical and mineral stains and spots is not an easy process no matter the height and should be tackled only by the most experienced in the trade. What can cause stubborn stains? Some of the biggest enemies of a clean and spotless window includes tap water, rain water run-offs, airborne moisture, environmental contaminants such as pollution, dirt and other airborne particles. A professional systematic cleaning schedule can remove these contaminants before stains occur. Professional window cleaners know how to use highly effective and environmentally safe solutions that can make stained and soiled windows look new and attractive again. 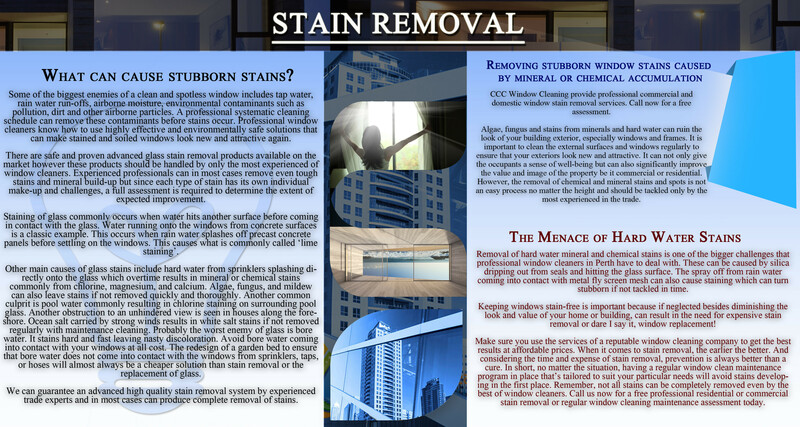 There are safe and proven advanced glass stain removal products available on the market however these products should be handled by only the most experienced of window cleaners. Experienced professionals can in most cases remove even tough stains and mineral build-up but since each type of stain has its own individual make-up and challenges, a full assessment is required to determine the extent of expected improvement. Whatever the case, one thing is for certain, the process is time consuming and can be costly, therefore regular maintenance cleaning is the best preventable advice in the fight against stains. Staining of glass commonly occurs when water hits another surface before coming in contact with the glass. Water running onto the windows from concrete surfaces is a classic example. This occurs when rain water splashes off precast concrete panels before settling on the windows. This causes what is commonly called ‘lime staining’. During rains or exterior cleaning processes such as high pressure cleaning, water usually hits the aluminum frames before splashing on the glass. In such cases, staining is more prominent on surfaces near the frames. Other main causes of glass stains include hard water from sprinklers splashing directly onto the glass which overtime results in mineral or chemical stains commonly from chlorine, magnesium, and calcium. Algae, fungus, and mildew can also leave stains if not removed quickly and thoroughly. Another common culprit is pool water commonly resulting in chlorine staining on surrounding pool glass. Another obstruction to an unhindered view is seen in houses along the foreshore. Ocean salt carried by strong winds results in white salt stains if not removed regularly with maintenance cleaning. Probably the worst enemy of glass is bore water. It stains hard and fast leaving nasty discoloration. Avoid bore water coming into contact with your windows at all cost. The redesign of a garden bed to ensure that bore water does not come into contact with the windows from sprinklers, taps, or hoses will almost always be a cheaper solution than stain removal or the replacement of glass. While to the human eye glass looks flat, if viewed under a microscope it actually looks more like a mini mountain range. This rugged surface at a microscopic level (micro-pores) is the reason why glass stains so rapidly and is so difficult to remove. The minerals and or chemicals deposited from tap water and other contaminants lodge in the micro-pores resulting in unsightly white or brown stains. We can guarantee an advanced high quality stain removal system by experienced trade experts and in most cases can produce complete removal of stains. Removal of hard water mineral and chemical stains is one of the bigger challenges that professional window cleaners in Perth have to deal with. These can be caused by silica dripping out from seals and hitting the glass surface. The spray off from rain water coming into contact with metal fly screen mesh can also cause staining which can turn stubborn if not tackled in time. Keeping windows stain-free is important because if neglected besides diminishing the look and value of your home or building, can result in the need for expensive stain removal or dare I say it, window replacement! Make sure you use the services of a reputable window cleaning company to get the best results at affordable prices. When it comes to stain removal, the earlier the better. And considering the time and expense of stain removal, prevention is always better than a cure. In short, no matter the situation, having a regular window clean maintenance program in place that’s tailored to suit your particular needs will avoid stains developing in the first place. Remember, not all stains can be completely removed even by the best of window cleaners. Call us now for a free professional residential or commercial stain removal or regular window cleaning maintenance assessment today. Disclaimer: Only an on-site appraisal by a qualified representative can ensure that stain removal or glass resurfacing is the best viable option in your case. Also, while it will always be improved, please note that depending of the severity of the stain, 100% removal along the edges of the glass may not be possible. From the thousands of high security mirrors in the Burswood casino to the hundreds of individual mirrors in household bathrooms, CCC have the required experience. If you have mirrors with any seemingly irremovable blemishes, call CCC for an on-site inspection. Keeping mirrors in homes, offices and public service establishments like hotels and restaurants can be tricky. Mirror cleaning requires an approach that’s slightly different than your regular window cleaning and that’s why hiring the services of a specialist who knows what it takes to keep mirrors bright, shining and spotless is highly recommended. At CCC, we offer mirror cleaning services which are handled by experts trained specifically in mirror cleaning. We can clean mirrors of all types and sizes, even those which require delicate handling. Mirrors are most commonly found in bathrooms of commercial establishments. They vary in size depending on the type of enterprise they are fitted in. In residences, mirrors are a common feature in almost every room. Large size mirrors are useful for the purpose of dressing and grooming. Many families use mirrors for functional, decoration and aesthetic purposes as well. Buying and fixing mirrors can be very costly. Keeping them clean can also be challenging. They can easily attract dirt and dust. Fingerprints, smudges and stains show up very prominently on mirrors because of the very nature of its surface. Regular and proper cleaning is imperative to maintain its attractive looks so that mirrors can serve the purpose for which they have been put up. It is a common practice among homeowners to attempt cleaning mirrors on their own using common cleaning agents. Most of the times, this can be a highly frustrating experience. Hiring professional mirror cleaning service is a smart thing to do because they have the experience, specialised tools and the technical know-how to do the job expertly and quickly. Our skilled mirror cleaning technicians know how to clean mirrors at homes and offices by using the right tools and processes according to the type of mirror. We make sure every mirror is cleaned to keep it spotless and shiny. We cover every mirror in your home or office while making sure that all the safety processes are strictly adhered to. In stage two the minerals from hard water have already bonded with the glass. No amount of scrubbing will get it off. But beware the glass will still scratch. The most common thing seen on glass after stain removal are scratches so BEWARE. If it won’t come off with a cloth and some elbow grease call a professional. We can clean and restore glass shower screens whether it be in a simple residential shower or grand hotel. Most shower screen cleaning products available over the counter are capable of removing only soap scum build up which means all your time, money and effort will go waste. High quality glass shower screen restoration can be achieved only when the hard water staining caused by calcium, silica and minerals are removed. In stage one mineral bonding this can be achieved with professional grade chemicals but in stage bonding the only way to remove stains is to resurface the glass. This cannot be done using ordinary cleaning products, tools and processes. You need the services of a specialist with experience in cleaning shower screens. Shower screens are made of untreated glass generally. This type of glass is porous and hence absorbs mineral deposits and soap scum rapidly. Shower screen glass is regularly subjected to mineral deposits, chemicals from shampoo and soaps and water whether soft or hard. Hard water is commonly blamed but soft water will stain the glass surface too. As layers and layers of scum get deposited on the glass, cleaning it becomes more difficult. When left untreated for long, it may discolour the glass and cause etching especially in harsh environments. 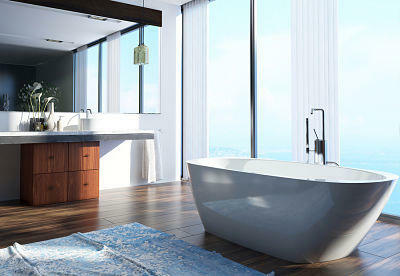 Such environments exist in bathroom of both commercial as well as residential bathrooms. Graffiti etched or painted on glass is not a pleasant sight, especially if they have been done on the glass structures of your business premises. Amateurish attempts at removal of graffiti from glass can result in more damage. You may be forced to replace glass which will inevitably cost you big dollars. The best way to make sure your glass is free from unsightly graffiti is to call in window cleaning experts specialising in glass graffiti removal. By hiring experienced professionals you can keep your windows at your Perth home and offices free of graffiti and give your place a neat, clean look at all times. After all, is there really much point having window cleaners in if they’re simply going to squeegee the glass and nothing more, leaving the graffiti and walking away with your hard earned money. Professional graffiti removers know how to tackle graffiti from various types of glass quickly by using the appropriate technology and processes and will leave your windows sparkling clean. Don’t settle for anything less. The best glass graffiti removal service will help restore your damaged and defaced window glass by removing graffiti of all kinds without affecting the texture, look or strength of the glass. Why spend hundreds if not thousands replacing glass when we can repair it. Graffiti removal can be scheduled after business hours and need not be disruptive. At CCC Window Cleaning, we have the skills and the expertise of polishing and removing damage caused on various types of glass. We can remove most types of graffiti including some pretty stubborn ones. Don’t replace it, restore it! We have helped many clients get rid of many new styles of graffiti and vandalism caused on glass surfaces. By adapting specialised and well honed techniques we have successfully removed graffiti for many of our clients across Perth and surrounding areas. We ensure speedy restoration, without the hassle of replacing your current windows on your home or commercial establishment windows. Call us to know how we can make your window glass look new, shining and spotlessly clean again.